Our online store is back and it’s better than ever! Holiday’s should be spent with family, not waiting in long lines at department stores. With our new online store, we make it easy to help you cut down on that long holiday To-Do list. The store will be a perfect place to sign-up for: men and women’s nights, memberships, wine dinners and gift cards, we have something for every golfer in your family! Hell’s Half Acre is probably the most visually interesting or dramatic hole on the course. This hole is an island green, par 3 surrounded by a sea of sand. The 8 bunkers total just over a half acre of sand. This was one of the first hole that was designed, it naturally fit into the topography and very little ground was moved during construction on #17. The hole is designed to where the longer distance tee boxes have a more difficult angle of approach. The forward tee boxes have a more receptive and inviting angle to the green. The green is slightly elevated and appears much smaller than actual. Hell’s Half Acre has a very large green with the total depth being 37 paces. Depending on the hole position, this could mean up to a 3 club difference in selection for most players. There is an on-going debate as to whether this or #13 is our signature hole. Blinding Cloud of Smoke is one of the most intimidating tee shots on the golf course. The hole is framed on both sides of the fairway by bunkers. There is a total of 10 fairway bunkers on this hole. If you play the either of the back two tee boxes the aiming line is over the right edge of first bunker on the left, just before the fairway starts. From either of those tees boxes the fairway is mostly hidden which raises the player’s anxiety over the tee shot. The fairway widens out in a couple of areas, making club choice off of the critical and leaving the player several options to attack the hole. The approach shot is uphill to a kidney-shaped angled green, with bunkers surrounding most of the green. The interesting thing about this hole is as intimidating as it looks from the tee to the green, upon the completion of the hole, turn around and look back toward the tee, the bunkers magically disappear, just like smoke. Now it looks like the easiest hole on the course. While we wish we could take credit for this unique design feature we actually honored Alister MacKenzie, who was the first architect to implement this into a course design. The Thirteenth hole is named Everlasting Torment since it is the longest hole on the course at 741 yards from the red tees. The prevailing summer wind is usually at your back so the hole plays downwind. Most people want to make the hole as short as they can and aim too far right and that brings into play bunkers or the rough. The aiming point off the tee is the bunker on the left hand side at the very corner of the dogleg. The aiming point bunker is not reachable on the tee shot. The second shot should also be aimed at one of the bunkers on the left, either one or two bunkers farther up from the tee shot. That leaves you the best angle with your approach shot and the green is most receptive from that position. The green slopes to the left, so the approach shot should be slightly to the right of the pin. The green is one of the most interesting on the course. The tournament “Sunday” position is back right. That position brings in a very deep swale on the left of the green, which very often brings 3 putts into play. If your ball is right of the pin, you are left with a very fast downhill putt. Everlasting Torment was not originally designed to be 741 yards. During construction, the owner Mike Merchent was standing behind where the original red tees were to get a better sight angle and said “This would be a great place for a tee.” The next day when he arrived on property a tee was constructed on that spot, be careful what you wish for, you might get it. Eden is a subtle hole, similar to number one on the front, not very long, with a generous fairway. A barn used to reside in the landing area. The mailbox post is still located in the left rough. The barn had a watering hole for the cattle that was surrounded by rocks. We took the rocks and repurposed them into a rock wall protecting the green. The rock wall was designed to frame the green, not to penalize poor shots. There is a hump on the left side of the fairway that is the aiming point for tee shots. The three bunkers on the right side of the fairway can come into play if the wrong aiming line is chosen, or the tee shot is poorly executed. We paid tribute to Bill Diddle on the green by installing one of his famous design traits “Diddle Bumps.” The green complex doesn’t appear to be overly difficult, but if you have some little bumps in the right places it can really add to the difficulty of the hole. We have a “Diddle Bump” in front of the green that actually blends into the green complex. This can really have a determining effect on the shot that you hit into the hole. It’s a very subtle bump out there, but it really impacts the play of that green. 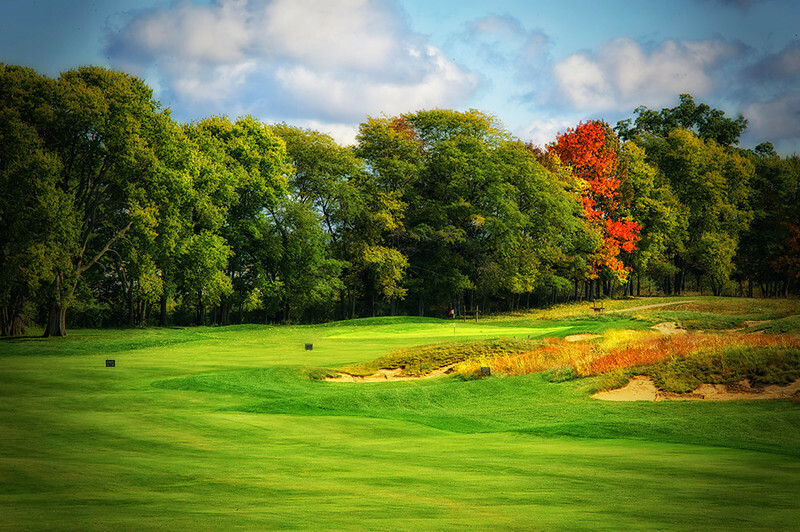 If you play golf in the Midwest, Michigan, Indiana, Illinois, you’ll come across a lot of Bill Diddle designed golf courses where he used these bumps to add a degree of difficulty on what appears to be an easy hole. Bill is one of the five founding members of the American Society of Golf Course Architects. He was born and raised right here in Carmel, IN. Our architect, Ron Kern, is a direct descendent of the Diddle design tree. With this upcoming weekend celebrating the day USA declaring their independence from Great Britain’s rule. With all of the celebrations and displays of patriotism, my thoughts quickly go to the idiom of “Freedom is Not Free.” There are many citizens and their families that have paid the ultimate price for us to have our freedom. For the 2nd year Purgatory Golf Club is very proud to be one of the host sites for World’s Largest Golf Outing benefitting Wounded Warrior Project. 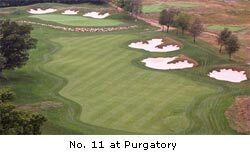 Last year we had over 90 participants play in the event at Purgatory. This year our goal is to have 120 players. We have an enormous amount of pride to be part of the group that has contributed over $885,000 in donations for our Wounded Warriors last year, and have raised over 2 million since 2011. The mission of Wounded Warrior Project is to honor and empower Wounded Warriors. WWP’s purpose is to raise awareness and to enlist the public’s aid for the needs of injured service members, to help injured servicemen and women aid and assist each other, and to provide unique, direct programs and services to meet their needs. Last year we had a presentation of arms, a live version of the national anthem, Fuzzy’s Vodka brought out their showcase semi truck, and we had a special guest play in the event, one of our wounded warriors. This year we are working hard to surpass last year in every aspect of the event. Monday, August 3rd we are having a 10:00 am shotgun: we are accepting players, donations and sponsorships. If you would like more information please go to www.worldslargestgolfouting.com or call us at the golf shop 317.776.4653. Please come out and join us for a day of fun and fundraising to support those who have fought for our freedom. Golf is a fantastic vehicle to use to raise money, awareness and build camaraderie. The PGA Tour gives more to charity in a year than the other 4 major sports combined. Once you start adding up all the charity golf outings, it is amazing how golf supports people in need and worthy causes. If this is the year you want to raise money for something that is near and dear to your heart, contact us. We will help you exceed your dreams of a great event. Why did you name the golf club Purgatory? The Golf Club originally had the working name Sassafras, the Architects original drawing is posted in the hallway, and titled with that name. There were some sassafras trees over in the north end of the property. That’s a relatively unique tree in Central Indiana, but informal market research indicated that Sassafras was not a name that serious golfers would embrace. In religious mythology, Purgatory is where souls pay for their earthly mistakes to gain entry into heaven. It’s about overcoming obstacles to attain eternal happiness. In medieval poetry, Purgatory was referred to as “sweet misery.” Golf often feels like that; acts of difficulty while obtaining something wonderful. 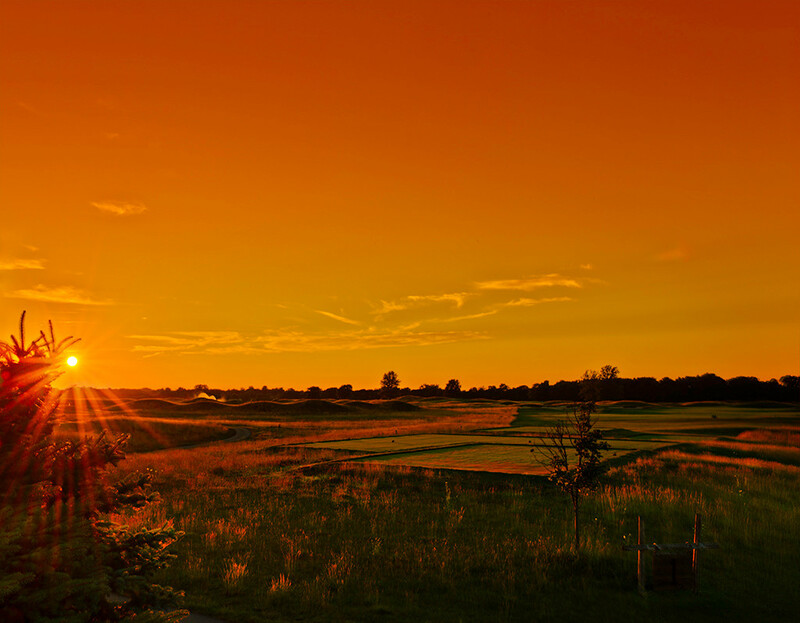 The golf course is named Purgatory because it’s a beautiful place for you to test your limits. 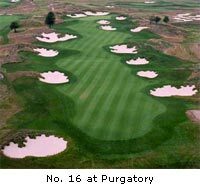 Purgatory is a name that immediately resonated with golfers and it fits, it fits with why people play golf. From the time you tee off on the first hole you have challenges and obstacles that you must navigate your way through until the last hole. You’ve had good holes and bad holes, and the shot that you think you should have made, and a few shots no one ever talks about, the miss-hits that end up perfect. Purgatory conjures images of great obstacle; it’s a name you remember. Every golf course is difficult if you play from the wrong tees boxes. Is our golf course a challenge? Absolutely. But does that mean you have to make it too difficult for yourself? The answer is no. Play a distance that allows you to enjoy the course and the day, you will find the course to be almost heavenly from the correct set of tees. The logo also is a discussion starter that even non-golfers find very interesting. There are a few architects that think the first hole should set a tone for the course and be a very challenging hole. Donald Ross immediately comes to mind as most of his course that I have played start off extremely hard and par is an excellent score. The first hole at Purgatory eases you into the rest of the day, it is relatively short in distance and wide in the landing area. It is a dogleg left, where the object is not about hitting it long, it’s trying to fit your tee shot into an area that’s 200 to 230 yards off the tee and 50 yards wide. So hopefully you start your round off out of the fairway, leaving yourself with a short iron, into a little bit of an elevated green that’s pretty receptive, not a lot of undulation, not a lot of movement to it … so you’re not going to hit a shot and be rejected left or right. Two decent shots ought to give yourself a chance for a par on the first hole; depending on the tee markers many longer players approach this hold as a classic risk reward as they may be able to drive the ball onto the green. I personally do not recommend this as the approach shot from very close and left of the green is very challenging and depending on the hole placement could eliminate a good birdie opportunity. When you are on the green take time to overlook the whole course as the green is the highest elevation point on the property. How are Golf Courses Rated? 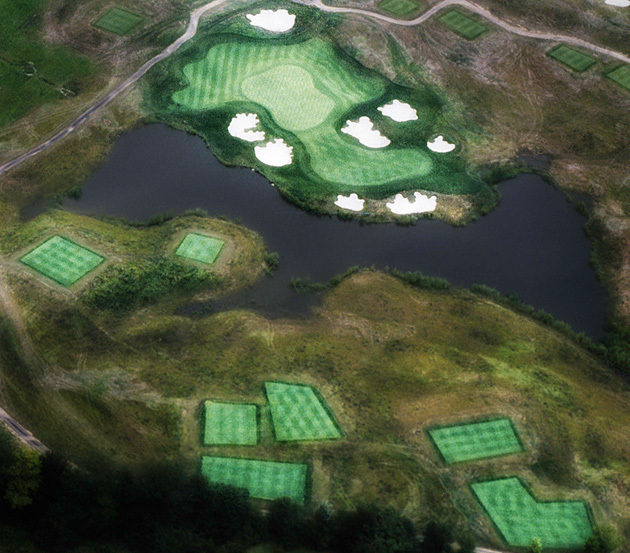 Purgatory Golf Club has won numerous awards throughout the years for having an outstanding golf course. Quite frequently we are asked how these awards are determined. 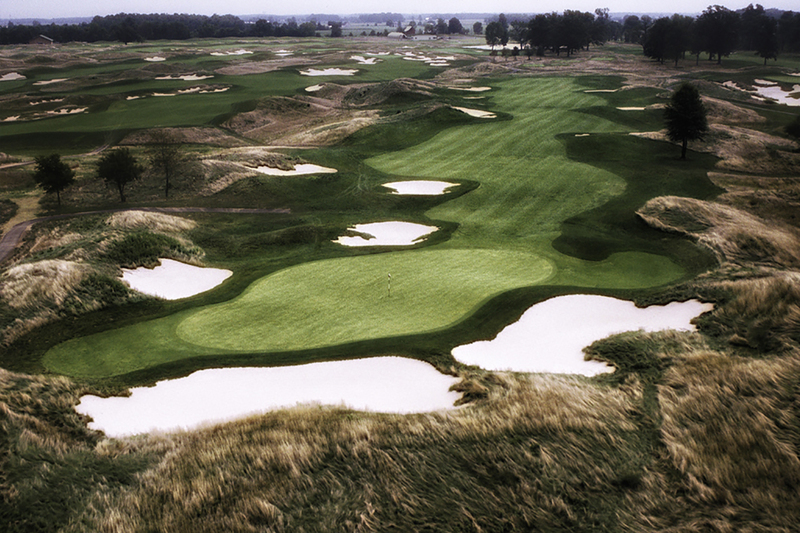 Many believe their favorite course is ranked behind other courses they may have experienced. They believe the rankings are skewed to a raters personal opinions and not very objective. Below is the criteria that Golf Digest raters use to determine these rankings. As you will notice, there is a formula to how they evaluate the courses. We thought this may be interesting and informative. You may enjoy this formula for evaluation the next time you play. Shot Values How well does the course pose risks and rewards and equally test length, accuracy and finesse? Resistance to Scoring How difficult, while still being fair, is the course for a scratch player from the back tees? Design Variety How varied are the golf course’s holes in differing lengths, configurations, hazard placements, green shapes and green contours? Memorability How well do the design features (tees, fairways, greens, hazards, vegetation and terrain) provide individuality to each hole, yet a collective continuity to the entire 18? Aesthetics How well do the scenic values of the course (including landscaping, vegetation, water features and backdrops) add to the pleasure of a round? Conditioning How firm, fast and rolling were the fairways, and how firm yet receptive were the greens on the day you played the course? Ambience How well does the overall feel and atmosphere of the course reflect or uphold the traditional values of the game? The average of each category is then totaled, double-weighting the Shot Values category with the result being the courses total point value. A course needs 45 evaluations over the past eight years to be eligible for America’s 100 Greatest. The minimum ballots for 100 Greatest Public is 25, for Best in State 10. While we enjoy the recognition and the awards, what we really find special is the enjoyment and interaction we have with our customers detailing their favorite aspects of our facility. In the upcoming weeks we will blog about our favorite holes and the most interesting characteristics of Purgatory for you to observe as you experience the course. They both agree to get your best results you need to practice along with playing. 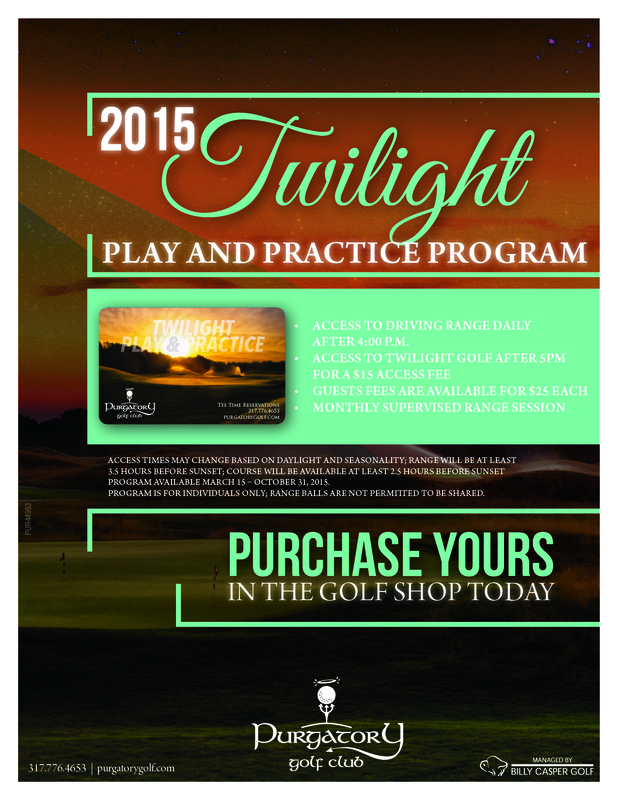 With that in mind we are happy to introduce our player development program, called the Twilight Practice and Play Program. Access to the driving range daily after 4:00 p.m.
Our bent grass driving range tee has been professional leveled to ensure level lies, perfect conditions to promote perfect practice. The range has strategically placed target greens and bunkers so you may replicate drives and approaches. As we know hitting it in the fairway is important for your score. Our 4 acres short game area is built so you can practice almost any shot that you will face out on the course up to 70 yards. The 7000 square foot putting green is undulated very similar to our greens on the course. Many have boasted that we may have the best practice facility in Central Indiana.